The Alta HR comes to the market as an update from the Alta model and as you can imagine adds heart rate tracking. The company made this tracker thinking on people that need to track their fitness activities and workouts at every level but also want a more fashionable accessory to wear on their wrist. The Alta comes with the PurePulse heart rate sensor that not only will cover all your heart rate tracking needs but also will add the newest features from Fitbit that cover your sleep patterns the Sleep Stages and Sleep Insights that will give you data on how to improve your overall health. At $148, the Alta HR is in the middle price range similar to the latest Fitbit Charge but with a more comfortable style and with a design that can go with you all day and night. So, what are the best features from the Alta HR? And who is it actually for? Keep reading and learn all about it. 7 Is The Fitbit Alta HR For You? In terms of looks, the Alta HR is similar to his predecessor, with a classic design featuring a small stainless steel sensor pod strapped to your wrist with a robust and sweat-resistant rubber strap. At just 15mm thick, it’s large enough to carry the display that is really easy to use. In comparison with the Charge 2, this tracker is 25% slimmer making it look like more stylish tracker instead of a big watch that grabs people attention. The tracker is also very lightweight which is very impressive having in mind all the features that come together with the tracker. The Alta HR is the slimmest tracker that comes with continuous heart rate tracking built in from the Fitbit brand. When compared to the Fitbit Alta the biggest modification in terms of looks is the strap that uses a watch buckle to fasten the device to your wrist. If you already have a Fitbit Alta you can use the same straps on the HR model. 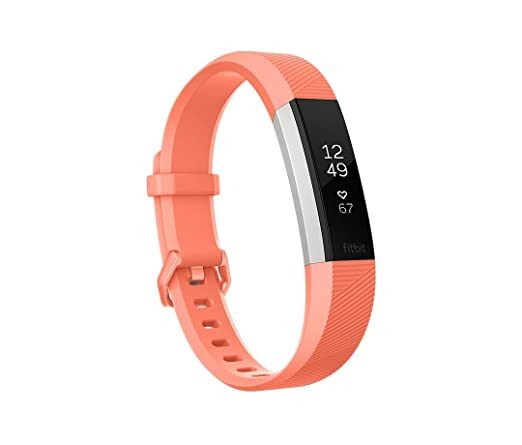 A new trend from the Fitbit family is having customization abilities the Alta HR bands come in different colors as well they are available in silicone or fancier leather finishes which make the tracker more fun and easy to wear at any type of situation. Silicone finishes include black, grey, fuchsia, and coral, whereas leather options are available in lavender, brown and indigo. There’s no physical button on the Alta HR, the tracker comes with an OLED display that responds to firm taps simply to wake it up and scroll through the menus. You can also activate the display by rotating your wrist as though you were looking at a watch but when we tried the tracker didn’t respond every time so you may need to rotate your wrist one more time in some cases. The smartwatch will track at 5 seconds intervals, giving you an accurate readout of your heart rate through the whole day, including your heart rate zones and average resting rate. You don’t need to be jogging or working out to have a track of your health the tracker will record all your daily activities giving you a better understanding of your overall health. Having statistics on your resting heart rate is a great way to understand your body, and the Alta HR is an accurate companion for this. When it comes to fitness tracking the Alta HR is similar to the original Alta is good for the basics like keeping tabs on the steps you take during the day, distance covered and calories burned. As well you have the move reminders that will let you know if you’ve been sedentary for too long. But the tracker lack on more advanced features that come with the Charge 2 but are not part of the Alta models like dedicated workout modes, VO2 Max tracking, guided breathing and Connected GPS abilities. So is a good companion for workouts but not so much for runs. One of the greatest things about the Alta HR is the Sleep tracking abilities that come with it. By using the heart rate and movement data together the Alta is more able to estimate the sleep stage you’re currently in, having in mind that the body goes through different phases during the night: light sleep, deep sleep, REM and also time awake. This is an amazing data to have since your body is managing different processes during each phase, such as filing away your day’s memories or helping your muscles to recover. So you can have the best from your recovery stages and your muscles get the best from each workout. In the app, you’ll see a bar chart with the hours slept and you can open a window that shows you how you moved between wake, REM, light and deep sleep. You can also get a breakdown of how much time was spent in each stage, and by tapping the ‘Benchmark’ button can see how your stats compare to other people in your age and gender bracket. The app will also explain you with the graphs how each stage of your sleep affects the body which, just like the benchmarking, puts everything in context. The Alta HR can provide you with call alerts, message notifications and calendar reminders pinged directly to your wrist. You need to synchronize the tracker with your phone first. When it comes to reading notifications on your wrist the Alta models aren’t the best ones since you need to scroll along vertically. You can add third-party apps including WhatsApp and Facebook Messenger but reading on the display can be pretty annoying at the point that you will end up grabbing your phone to actually check the messages. The good thing is that the device is going to vibrate when you get a notification so at least you know when someone is trying to reach you out. When it comes to fitness notifications the Alta HR is a better companion letting you know when you are not moving enough. You can put the movements notification to whatever makes sense for you as well the day that you want the tracker giving you alerts. The Alta HR is compatible with iOS, Android, and Windows and it will provide you with all your data in a simple and accessible layout that makes you understand your metrics very easily. Mapping out all of your data in charts, it will break down all your daily activity by the standards that you wish to track like steps, distance, time active or calorie burn. All this metrics can be tracked in a regular way or as deep as you wish with the close details available ranging from the number of calories burned during that 5K run to the steps taken on your walk home from the train. When it comes to heart rate tracking the Alta HR is pretty amazing having the ability to understand not only how your heart rate reacted to the exercise, but also the heart rate zone that you were working in over that time period giving you a much better indicator of your fitness efforts. Plus when you add the daily resting heart rate map you are going to be able to understand your body and improve your fitness levels. Building on the core data, there are plenty of guiding pointers and encouraging words to get you pushing to that next personal best. The tracker comes with badges and Challenges that are a great way to motivate you, you can also set up friendly competitions with your close friends to push yourself. When compared to other Fitbit models the Alta HR is one of the most lasting in therm of battery life (except the Zip That can lat up to 6 months). Fitbit says that the tracker can last up to 7 days without the need of a recharge. When we test the Alta HR the battery was good for 6 days so is pretty possible that you can use it for one week. Something that we didn’t like was that the power cable that comes along with the tracker since is too short. So unless you have an especially low side table or an extension lead, you’ll be charging the tracker on the floor. Is The Fitbit Alta HR For You? The Fitbit Alta HR is the fitness tracker for those that are on the need of tracking their activities to develop and maintain a basic level of fitness rather than strive towards a new half marathon personal best. It’s a tracker that will motivate you to get moving, and take you from general activity to a bit of light sport without ever feeling like you’re wanting for features. The heart rate scanner is an amazing way to keep a truly accurate track of your enhance fitness levels and calorie burn in case that is what you are looking for, while the company app does a great job of making your data accessible and understandable. With the Alta HR, Fitbit has taken what was already a solid activity tracker and made it better. With a focus on sleep, well-being and heart health instead of high-end fitness. The improved sleep stats are a big step forward, although will require time and perseverance to really kick in with insightful stats. But the Alta HR brings high-end fitness tracking and heart rate data into a form factor that’s wearable and desirable.